No matter the time of year, boredom doesn’t stand a chance in Ruhpolding, Germany. Depending on your mood, you can do sports, go climbing or hiking in the Alps, go for a swim or take an excursion to nearby destinations. Whether you want to go on an active holiday, stress-free getaway or spa break: in Ruhpolding, everyone can make their Bavarian holiday dream come true! Mountains, rivers, lakes, forests, fields – that is the stuff holiday dreams are made of in Ruhpolding! The Ruhpolding spa town is located in Bavaria, surrounded by beautiful nature. Those who visit us in spring, summer or autumn have numerous possibilities to fill their holiday with life and excitement. Mountain-bike trails reflecting all levels of difficulty! Whatever the challenge you seek, you are sure to find it right here. 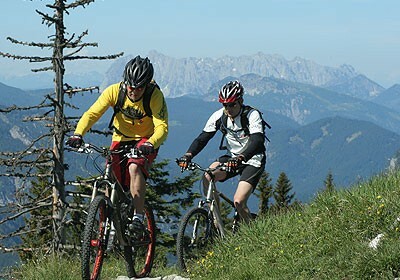 The most beautiful MTB routes in the Chiemgau Alps lie at elevations ranging from 600 to 1800 metres above sea level. Our most ambitious bikers will definitely want to check out the clearly marked Chiemgau MTB Marathon Trail, which runs through the countryside surrounding such communities as Inzell, Ruhpolding, Reit im Winkl, Bergen, Schneizlreuth and Siegsdorf. Ruhpolding has become a veritable El Dorado for cyclists in recent years. The broad valley basin, with side valleys that penetrate deep into the mountains, was seemingly predestined to become a cycling paradise with universal appeal. A seemingly infinite network of bike routes in and around Ruhpolding has something to offer for everyone, whether they happen to be casual cyclists, families with children, or passionate downhill athletes. Hop onto your bike saddle and experience the unique mountain landscapes of Upper Bavaria, magical lakes and rivers, green forests and, last but not least, the heartfelt welcome you receive from the Bavarians themselves. Countless walking, hiking and mountain paths, as well as the recently opened Nordic-Countless walking, hiking and mountain paths, as well as the recently opened Nordic-Walking trail, lead out through our broad valley, along the banks of the Traun, past the traditional mountain inns, all the way up to the peaks of the Bavarian Alps. And even if you don't get around too well on your own two feet, the Unternberg chair lift and the Rauschberg lift will carry you comfortably up into our Alpine world. Once at the top, you can head out along a facinating mountain nature trail, which will reveal to you a colourful world of Alpine butterflies. Friendly mountain inns and restaurants invite you to enjoy a quick snack or mouth-watering Bavarian specialties. And whether you are merely out for a leisurely stroll, or are a mountain goat in your own right, you are certain to relish the breathtaking Alpine panoramas. Ruhpolding is the perfect starting point to discover the Chiemgauer Alps as an mountaineer. As a beginner or experienced mountaineer your climbing possibilities are almost unlimited. For beginners there is a climbing wall to practice. The more experienced mountaineers will enjoy the steep walls of the Kampenwand, the Geigenstein, Hochplatte or other great mountains of the Chiemgauer Alps. Enjoy the fresh air and the wind in your hair, not to mention the spectacular view! Another way to explore the Chiemgauer Alps is a ‘via ferrata’. A ‘via ferrata’ is a protected climbing route found in the Alps and certain other locations. There are plenty ‘via ferrata’ in the Chiemgauer Alps to Explore. The Loden-, Mitter and Weitsee are only a short drive from the center of town in the direction of Reit im Winkl, located in a beautiful scenery and are considered to be the warmest Bavarian mountain lakes. The whole area is a nature reserve and remains completely free of commercial companies. The immense Chiemsee is another bathing and swimming papadise to enjoy. It's also possible to rent boats to discover the beach of the Chiemsee for the waterside. Whether on the Unternberg or Rauschberg – freedom is limitless when you are paragliding! Paragliders love the constant up-winds on the Unternberg, hang-gliders enjoy the thermal activity on the Rauschberg and the convenient ride up the mountain thanks to the Rauschberg cable car – enjoy your flight! Here, hang-gliders are in seventh heaven and the starting possibilities for paragliding are simply superb. It has plenty to offer: the constant up-winds from the valley allow hours of soaring along the side of the slope from midday to sunset. To the left and the right of the river Traun is the tennis court of Ruhpolding situated. It’s on of the most beautiful tennis courts due to its spectacular location. The Ruhpoldinger Tennis court has 10 outdoor courts and 4 indoor courts. The large 18-hole golf course in Ruhpolding is surrounded by picturesque mountain views in the heart of Chiemgau, Germany. But that’s not all. In a radius of about 60 minutes by car, you can find almost 40 more golf courses – paradise-like conditions for passionate golfers who want to take a golf holiday in Germany! The golf course in Ruhpolding in the heart of the Chiemgau Alps, with natural biotopes, water hazards and well cared for greens, offers plenty of diversity and a fantastic outdoor experience with incredible views which lend unique impressions. It offers all golfers, from beginners to pros, the ideal conditions for a perfect golf holiday in the Bavarian Alps. Have you ever tried fly fishing or traditional fishing? This sport can be practised no matter the weather and the amount of fish here offers plenty of variety. You will certainly fall in love with the river Traun, a turqoise 5-10 m wide river flowing from the mountainside. In Ruhpolding trout do not swim ... they fly in mineral water. These browns and rainbows indeed look nice against the white gravel bed. The river is rich in insect life, from ephemerids in various sizes to caddisflies and fluorescent yellow needleflies in the summer. An active summer holiday here also includes extensive rides in the nature around Ruhpolding. Horse lovers will get their money’s worth at the local Gestütshof Brendlberg. Here, about 40 horses are ready for riding; among other things, introductory classes for beginning riders or guided riding tours are on offer. Even though summer is approaching… a horse-drawn carriage ride through the picturesque winter landscape is a truly romantic experience of nature. Look forward to a varied active holiday in Bavaria! In a time when everyday stress and hecticness rule, we can recharge your empty batteries: with the power of nature. This is the ideal refuge when it comes to escaping the daily rush. Let the peaceful mountains take effect. Fill up on natural energy radiated by the fields, mountains and rocks. In Ruhpolding – ‘Ruhepol’ means ‘a calm anchor’ in German – the name says it all. Find calm. Find yourself, your calm anchor – here with us in Ruhplding. Ruhpolding’s amusement park is one of the most wonderful in Bavaria. It's located in the midst of one of the most beautiful natural settings imaginable.. The park is open all year no matter the weather and its many attractions are fun for young and old. Fairy-tale experiences and a day full of fun and excitement are just a magic word away.